In a resolution dated the 9th of March, 2018, Minister Carmen Castillo Taucher of Chile’s Ministry of Health has announced that there are sufficient public health reasons to support a compulsory license on medicines for the hepatitis C virus (HCV), as requested by Corporacion Innovarte, Fundacion Renacer, members of the Chilean Congress including Giorgio Jackson, Karla Rubilar, Miguel Angel Alvarado, and Gabriel Boric, and patients in March 2017. The announcement is Ordinario A15 No.1135, and the formal resolution is here. The determination of public health justifications is not the compulsory license itself, but rather satisfies the requirement under Article 51(2) of the Chilean Law of Industrial Property No.19.039, allowing non-voluntary licenses for reasons of public health. This announcement from the Chilean Ministry comes in the wake of two votes from the Chilean Camera de Diputados calling for the government to use compulsory licenses for HCV medicines — the first in January 2017, and the second in January 2018 — as well as international support from civil society, including a letter from 29 NGOs around the world, and additional constructive technical assistance from groups such as Knowledge Ecology International, DNDi, and South Centre. It also follows a series of actions by elected officials and governments around the world to confront the high prices of patented HCV medicines, including the recent government use license in Malaysia for sofosbuvir, a request by 18 Democratic members of the U.S. House of Representatives for the government to use its authority under 28 U.S.C. § 1498 for HCV drugs, and Resolution Number 005246 of 2017 by Colombia’s Ministry of Health to explore whether there are public interest reasons for a compulsory license on HCV drugs (as requested by Colombian civil society groups including iFARMA and Mision Salud). The resolution cites the World Health Organization’s estimate of 4.1 million HCV-infected individuals in Latin America and the Caribbean, as well as PAHO’s report of a 3% mortality rate due to the hepatitis C virus and related illnesses. The document goes on to additionally cite several resolutions from the World Health Assembly, including WHA63.18, which includes a call for members to “(8) … consider, whenever necessary, using existing administrative and legal means in order to promote access to preventive, diagnostic and treatment technologies against viral hepatitis.” The Ministry’s order additionally refers to WHA67.6, which urges members to undertake measures to ensure and strengthen vigilance, treatment, and access to treatment for viral hepatitis. The Ministry discusses both the high effectiveness of direct-acting antiretrovirals for HCV, as well as the high prices of those medicines, noting that even with price reductions the costs in actuality are still prohibitive, while the prices of generic HCV medicines are a fraction of the patented versions. 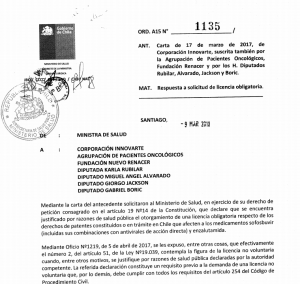 Almost as an aside, the Ordinario includes one paragraph that mentions that the Chilean IP office (INAPI) notified the Ministry of Health that there were no patent applications or patents for enzalutamide (Xtandi), which was also part of the initial compulsory licensing request. Because there are no patents or patent applications, the Ministry announced that they therefore would not be declaring public health justifications for a compulsory license on that drug. This does suggest, however, that without patent issues, a generic manufacturer could enter the Chilean market to increase affordable access to the important prostate cancer medicine, and also illustrates the importance of and public interest in greater transparency of patent landscapes. A longer statement from Villaroel mentions several individuals and groups that have worked on this, such as Representative Giorgio Jackson, which you can read here, as well as his timeline on the disputehere. A background FAQ on the compulsory licensing request is available here.